Witness the most beautiful part of Samoa: the Aleipata district, which has a landscape dominated by waterfalls, white sandy beaches and traditional villages. From Apia, a 65km (40 mile) drive leads to the Falefa Falls, Fuipisia Falls and Mafa Pass. Discover some of Samoa's stretches of rainforest and conservation areas on an educational tour of Tanumapua, close to Apia. New species of wildlife are still being discovered including two new butterflies in 2009. Eco-tourism on the islands includes several ecological research programmes and eco-lodges. Go snorkelling and diving in the Palolo Deep Marine Reserve on Upolu island, which abounds with marine life. Looking for gnarly surf? Then you've come to the right place. Waves break on coral reefs around the islands, which makes for sick surfing (albeit only for experienced board riders). In some villages, surfing is not allowed on Sundays. Behold the largest ancient structure in the whole of Polynesia – the Tia Seu Ancient Mound is an awe-inspiring pyramid that stands at 12m (39ft) tall. Known to Samoans as The Pulemelei Mound, you can find it in the Letolo Plantation of the Palauli district in the eastern end of Savai'i Island. See the tomb of Scottish poet and novelist Robert Louis Stevenson, on top of Mount Vaea, from the lawn of his former home near Vailima. The house was restored and officially opened as the Robert Louis Stevenson Museum in 1994 on the 100th anniversary of his death. See where Return to Paradise was filmed in 1952. The attractive Lefaga Village, on the southwest coast, can be reached by a cross-island road. Just off the coast of Upolu is Manono Island, which was the inspiration behind the WWII musical Tales of the South Pacific. 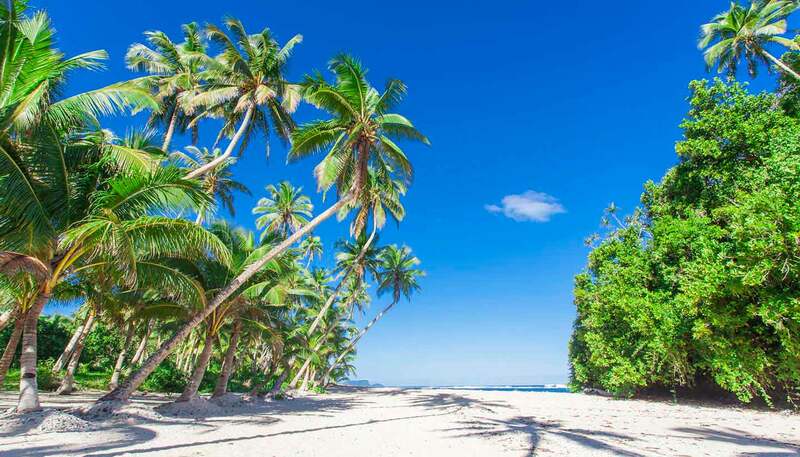 Bask on the many beautiful beaches Samoa has to offer. Excellent freshwater swimming is possible at Falefa Falls, Fogaafu Falls, Papase'ea Sliding Rock (a rock slide down a waterfall into a deep freshwater pool) and Puila Cave Pool. Boats can be hired for net, spear, deep-sea and snorkel fishing. Visit the Auala Green Turtle Conservation, where guides show you turtles before they are released back into the wild. If you're lucky you could also get the chance to swim with these gentle giants under the supervision of guides. You can also find the turtles in their natural habitat in the sea around Nuutele Island. Hike the dozens of routes on the islands, ranging from coastal walks to mountain treks. Trails tend to grow over rapidly and can sometimes be difficult to get through. Visitors should ask for local advice and permission before heading off, and pack plenty of provisions. Chances are your first stop will be in Upolu, Samoa's most populous island. Its capital and main commercial centre, Apia, lies on the beautiful north coast. In 2009, the city was badly damaged by a tsunami with reminders of the disaster visible throughout the countryside. But the island is bouncing back and visitors will be smitten with beaches, coral reefs and tropical grandeur. Watch for flying foxes and birds in the Tafua Peninsula Rainforest Preserve, near the coastal village of Tafua. The teeming forest is also one of the few habitats for the endangered and indigenous tooth-billed pigeon also called the Manumea, the national bird of Samoa.